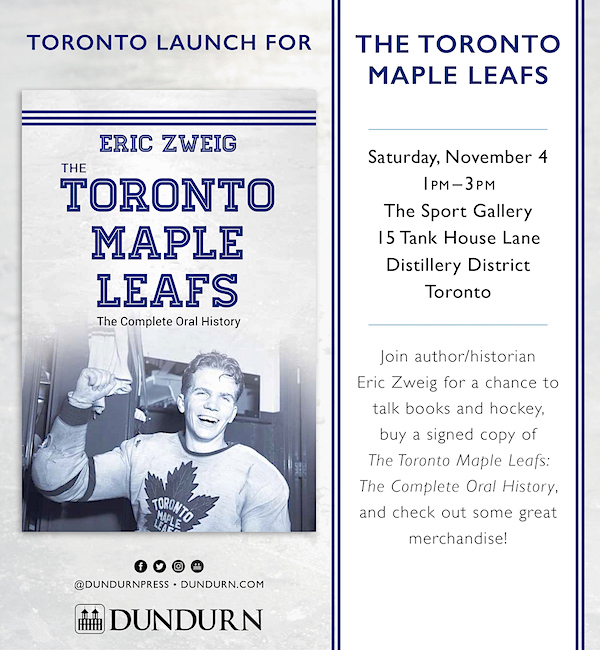 With the team off to a great start, invitations to the Toronto launch of my new book, The Toronto Maple Leafs: The Complete Oral History, went out by email earlier this week. If you didn’t receive one, and you’d like to come, I’d love to see you! A copy of the invitation is included at the end of this story. The Leafs were pretty much at the worst of their recent struggles when I began working on this book. Still, the only real direction offered by my editor was “give me lots!” I took that pretty literally. We always knew that the book was going to be 10 chapters long, but when I finished the first draft of Chapter 1, I was already over 25,000 words! By the time all 10 chapters were complete, I delivered a manuscript of almost 170,000 words. 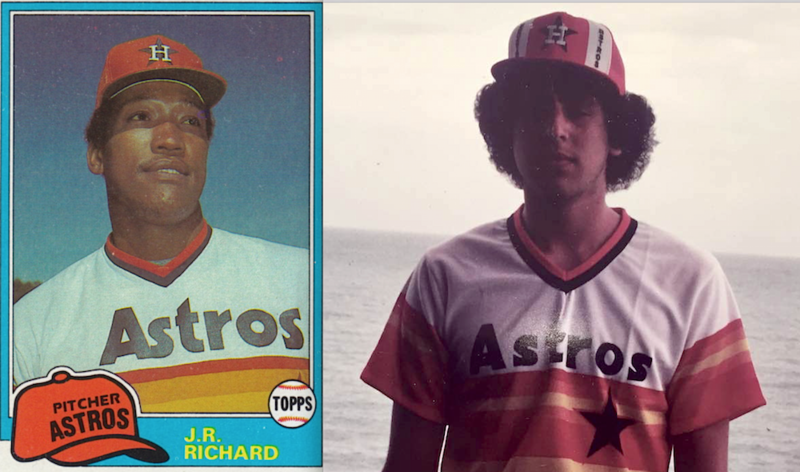 We’re talking 100 years of history here, but clearly that was going to be too much. During the editorial process, we got it down to about 140,000 words. With pictures, that still came out to a book of 450 pages! Before Toronto qualified for the playoffs (by winning the second half of the split-season schedule), Charlie Querrie and George Kennedy of the Canadiens had expressed differing opinions on the style of play the Torontos employed, particularly when they were at home. – The Montreal Star, December 29, 1917. “Manager George Kennedy of the Canadiens has had his bluff called. 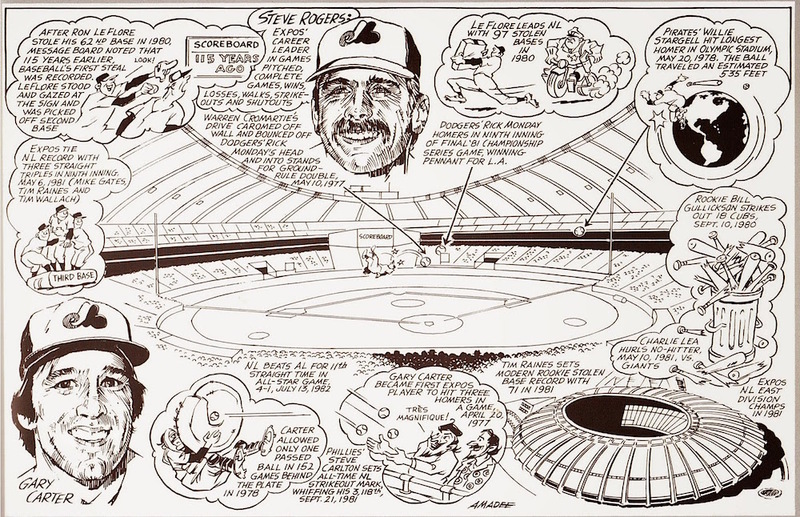 George, the wise one, spread a lot of false reports when he returned to Montreal after his two beatings here. Kennedy told the Montreal newspaper men that the Torontos did not play hockey, but just cut his players down. Manager Querrie of the blue shirts has gone Kennedy one better, and wants the sporting scribes of Montreal and the Peasoup public at large to know that every team that visits Toronto is given a fair shake. “Mr. F. Calder, President National Hockey League: Dear Sir, – Our club would be pleased if you would attend the game here on Monday, 28th January with the Canadiens. “During the past few weeks Manager Kennedy of the Canadien Club has stated thru the press that his players are roughly used here, and also intimidated by the police. – The Toronto World, January 25, 1918. It’s unclear if Kennedy or Calder were in attendance on January 28. Toronto won the game, 5–1. – The Globe, Toronto, January 29, 1918. But the score of the game was not the biggest story that night. 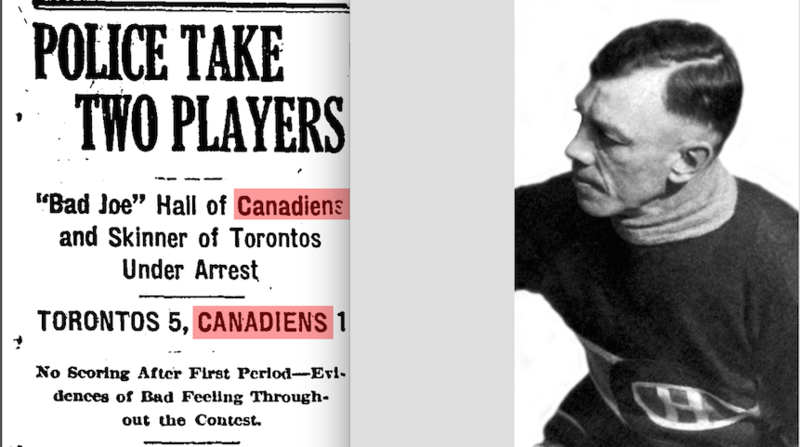 “‘Bad’ Joe Hall of the Canadiens and Alf Skinner of the Toronto team are under arrest as the result of an assault and counter-assault which occurred in last night’s game between the two teams at the Arena. Toronto defeated the Canadiens by a score of 5 to 1 in a game in which there was an under-current of feelings that was responsible for many minor outbreaks throughout the contest. The collision which resulted in the arrest of the two players occurred shortly after the start of the final period. Skinner took the puck down the ice and was checked by Hall. He dropped to the ice and as he did made a pass with his stick at Hall, who was standing over him. Hall raised his stick and brought it down upon Skinner’s head and the latter was carried from the ice unconscious. – The Toronto World, January 29, 1918. “Like a blessed peacemaker, more prone to pity than to punish, Squire Ellis to-day remanded for sentence Alfred Skinner and Joseph Hall, the two hockey players, members respectively of the Torontos and the Canadiens, who were arrested for disorderly conduct after the game at the Arena Gardens last night. ‘As the matter has apparently been settled to the satisfaction of all parties out of court, there will be no punishment here,’ remarked his Worship. The two erstwhile opponents who had whacked each other over the heads with hockey sticks in the heat of contest, smiled like brothers as they entered a plea of guilty. ‘They are the best of friends to-day,’ said their counsel, W. Hoskins, adding later that hockey games could not be played without a rap or two being given. Sergt. McKinney made an eloquent plea for clean sport. ‘Fracases like this are going to ruin sport,’ said he. ‘The public don’t want to see slugging matches.’ The sergeant further stated that Hall was the aggressor. – The Toronto Daily Star, January 29, 1918. On October 11, 1929, hockey fans reading their daily newspaper learned that Cy Denneny had announced his retirement the previous evening. Fans of long-ago hockey history still know Denneny’s name, but it’s not one that’s very familiar anymore. 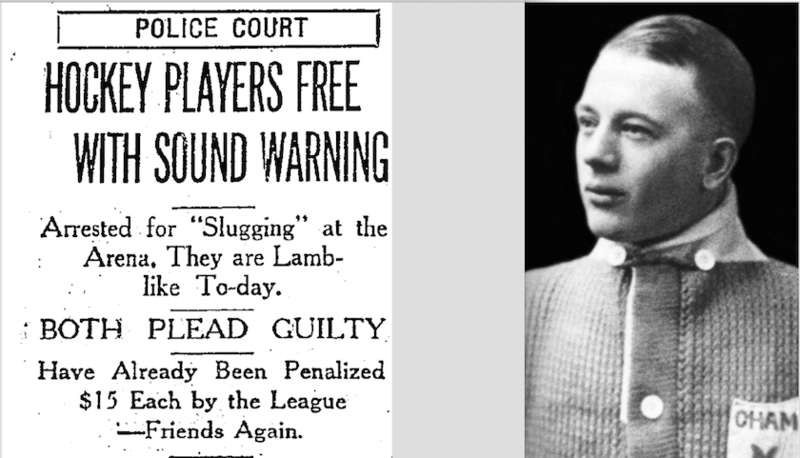 Still, this would have been pretty big news to the fans of the game 88 years ago today. The second clipping here appeared in The Ottawa Journal. Denneny began his pro career during the 1914-15 season of the National Hockey Association. He joined the Ottawa Senators in 1916-17, and remained with the team when it entered the NHL the following year. He finished up with Boston in 1928-29. Except for the fact that he won the Stanley Cup five times in his career (a pretty big difference! ), Cy Denneny was sort of the Marcel Dionne of his day: a star player who was often overshadowed by someone else. Denneny led the NHL in scoring one time (in 1923-24), but finished second on five occasions and third and fourth one time each. You may be aware that the NHL has recently unveiled revised statistics put together during a six-year project to digitize old game sheets. This made news recently when it was announced that, among 6,000 bits of corrected information, Maurice Richard had now gained an extra assist among his career scoring totals. Cy Denneny, who was one of the first players to experiment with curving the blade of his stick, was elected to the Hockey Hall of Fame in 1959. A few months later he gave an interview to Tom Mitchell of The Canadian Press in which he compared the hockey of his time to the game as it was played in 1960. He thought the then current game was much more dangerous. From the Ottawa Journal, February 24, 1960. It wasn’t just his arms that took a beating. 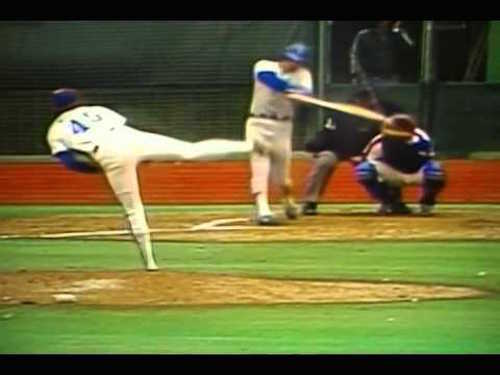 Denneny recalled that his hips were “black and blue after every game” and admitted that at the age of 68, he had a touch of arthritis in his left hip and leg and walked with a cane. He passed away at the age of 78 on September 10, 1970. The NHL opened a new season last night with games in four cities, including Toronto in Winnipeg where the Maple Leafs beat the Jets 7-2. After last season’s success, hopes are high in Toronto, where the home season begins on Saturday night against the New York Rangers. One hundred years ago (albeit not until December 22, 1917), the first NHL game in Toronto was also played on a Saturday night. Three nights earlier, in Montreal on December 19, the Arenas (I won’t get into the name game again) had dropped the first game in NHL history 10-9 to the Wanderers. High scores were not uncommon in this era, but 19 goals in a game was pretty unusual. Everyone in hockey knew that Toronto’s netminding tandem of Art Brooks and Sammy Hebert was nowhere near the quality of future Hall of Famers Georges Vezina of the Montreal Canadiens and Clint Benedict of the Ottawa Senators, nor even Bert Lindsay – the father of future Red Wings legend Ted Lindsay – of the Wanderers. 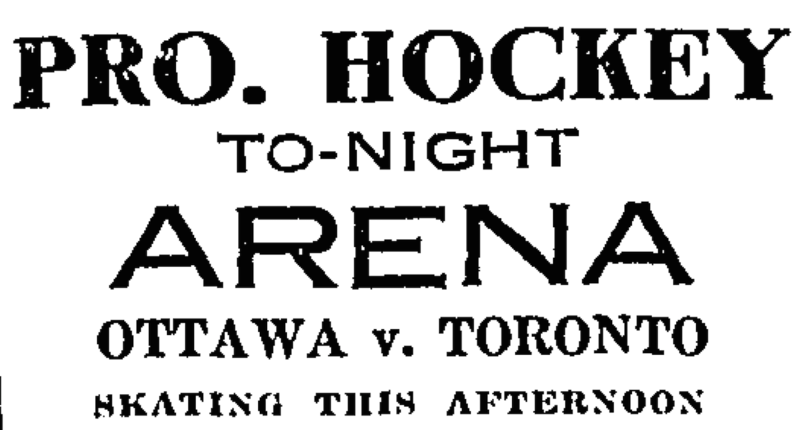 Ad for Toronto’s NHL opener in The Globe on December 22, 1917. 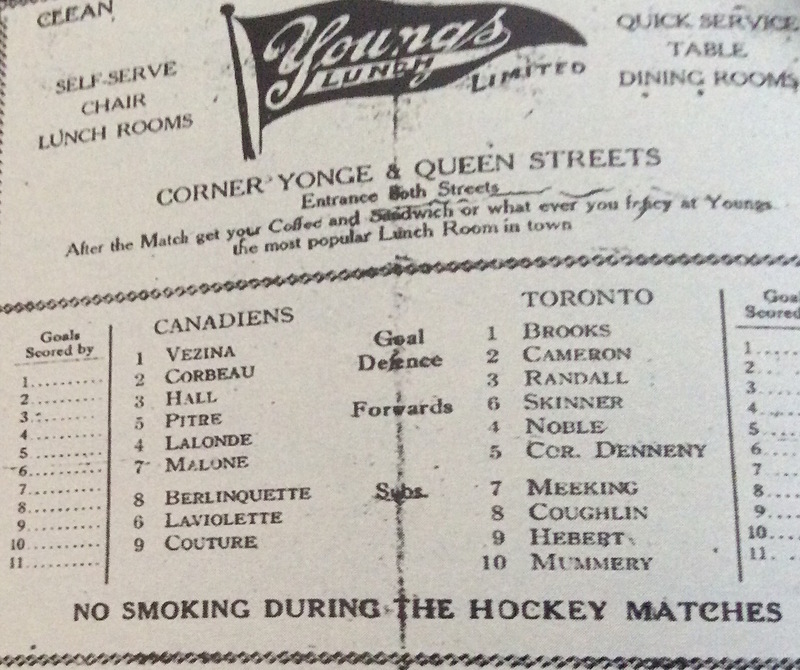 It was generally agreed that the Wanderers had been outplayed in the Montreal game, but with Hebert surrendering five goals in the first period and Brooks five more over the final two, Toronto came out on the wrong end of the score. 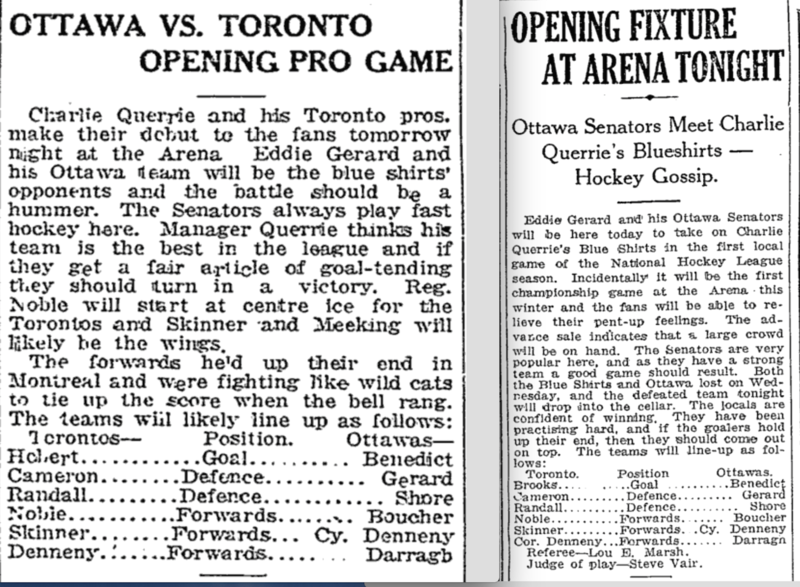 “Our most important need is a good goalkeeper,” said team manager Charlie Querrie in The Globe newspaper on the day of the home opener against the Ottawa Senators. The Globe provided a pretty scant preview of the game, but did report that Toronto’s net might be guarded that night by a well-known (but unnamed) local amateur. The Toronto World didn’t say much either, but also noted the goaltending would need to come up big. 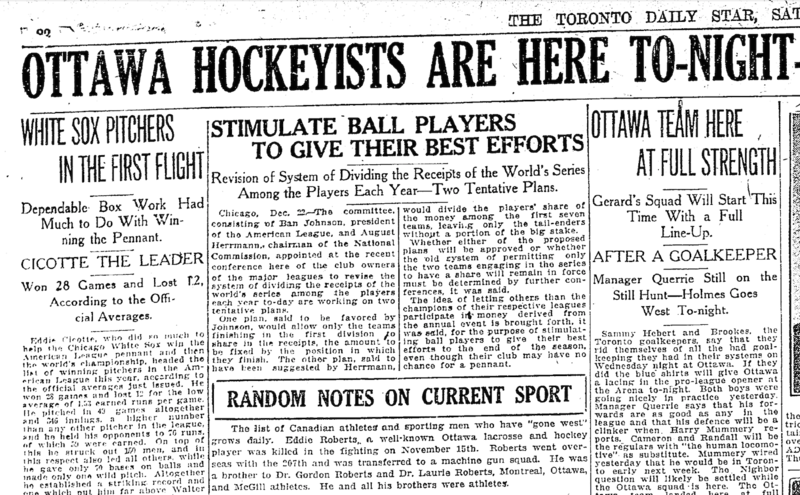 Pre-game coverage of Toronto’s NHL opener in The World on December 21 and 22, 1917. The World also reported that a large crowd was likely for Toronto’s NHL opener. The Arena Gardens – aka the Mutual Street Arena – held about 7,500 at this time, but no story I’ve seen actually notes the attendance that night. Chances are it wasn’t a sellout … although the crowd must have been quite a bit larger than the 700 or so people estimated to have been at the Wanderers’ opener in Montreal. Hockey fan or not, no one could really argue today that the best of the sport is played anywhere but in the NHL. That wasn’t necessarily the case in 1917. While the calibre of play in the NHL and its western professional rival, the Pacific Coast Hockey Association, was likely better than that of the top amateur leagues across the country, there were just so many amateur teams and leagues in Toronto and area that the audience was easily fragmented. And, really, the brand-new NHL wasn’t seen as anything special back in 1917. It was merely considered a continuation of the old National Hockey Association (which had operated since the winter of 1909-10) under a new name. Hockey fans in 1917 would have noted little difference between the NHA and the NHL. But the biggest problem facing the NHL in its inaugural season was that the World had been at war since 1914. Many amateur sports leagues in Canada had shutdown for the duration, and even though pro hockey was thought to be good for morale on the home front, attendance was falling and teams were folding. By 1917, there were plenty of people wondering why some fit young men were being paid good money to play hockey at home while others were fighting and dying overseas. Indeed, on the day of the Toronto opener against Ottawa, a preview of the game in The Toronto Star shared space on the sports page with a report that former pro hockey player Eddie Roberts (the brother of future Hockey Hall of Famer Dr. Gordon Roberts, who was then starring with the PCHA’s Seattle Metropolitans) had recently been killed in action. 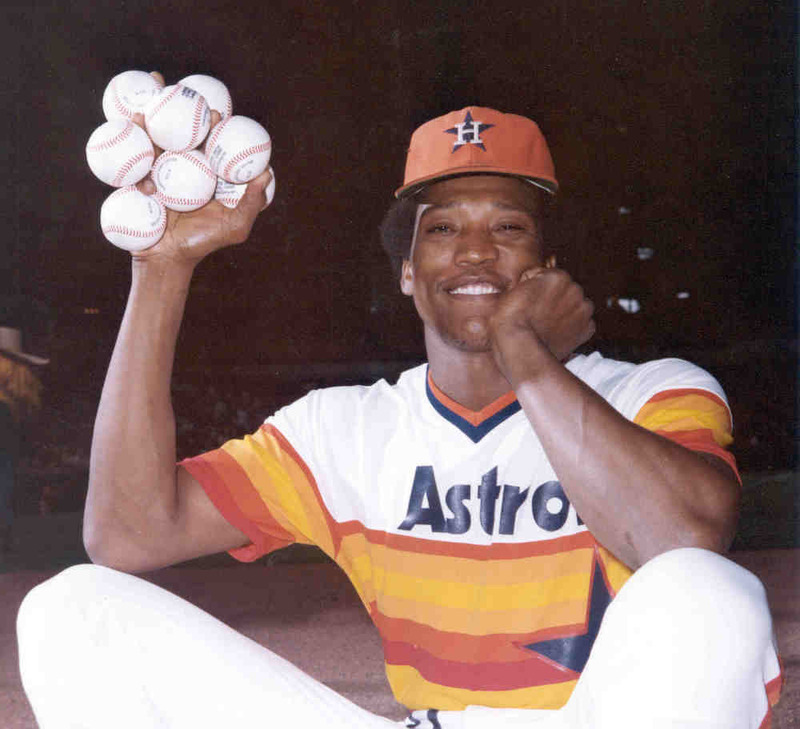 The death of Eddie Roberts is noted in Random Notes on Current Sports. As for the opening game, Art Brooks surrendered the first goal to Ottawa, “but thereafter,” according to The Star, “the Torontos were always in control of the situation. They displayed superior speed, checked back better, were better individually, and their flashes of team play bewildered the Ottawa defense.” The result was an easy 11-4 victory. After a decent showing in the next game at home against the Canadiens, Brooks looked bad in a 9-2 loss back in Montreal and was replaced by Sammy Hebert in a 6-5 win in Ottawa on January 2. Two days later, Toronto’s goaltending problems were solved when the team was able to sign a future Hall of Fame netminder of their own: Harry “Hap” Holmes. With Holmes in goal, Toronto went on to win the second half of the split-season NHL schedule and beat the first-half champion Canadiens in the playoffs to win the league title. They then defeated the PCHA’s Vancouver Millionaires to win the Stanley Cup. One hundred years later, here’s hoping!